Born and raised in McKinney, Texas. Graduated from Texas Tech with an Economics degree. Active member of First Christian Church, Serves on McKinney Ex Students Associate Board, Supports local sports teams and Lions Club of McKinney. Sporting Events, Concerts, Hunting and Fishing. 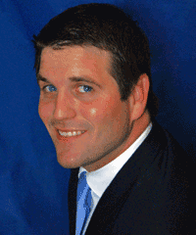 The Nationwide Insurance: Garret B Holubar in McKinney, TX provides the following products. To learn more about each insurance product, click on the links below. Garret B Holubar is your go-to source for friendly, knowledgeable advice about your McKinney auto insurance. It doesn't matter if you're trying to determine the right claim limits for your household, or if you're a first-time owner of an RV, motorcycle, or specialty vehicle. Whatever your question, we can help you find quick, confident answers and speedily take care of your auto insurance needs. Garret B Holubar customer needs run the gamut from meeting minimum requirements for the state of TX and finding low-as-they-go premiums, to building comprehensive, personalized coverage through various Nationwide programs. Along with higher claim limits, roadside assistance, rental reimbursement, and gap insurance are some of the popular options. You can also reward yourself for every year of claims-free driving by enrolling in the Vanishing Deductible® program. There are sizable discounts available to most customers, everything from good grades to multiple policy discounts. We also offer plenty of billing and payment options to make running your household just a little bit easier. Whether you're in our neck of the woods on 2411 Virginia Pkwy or no matter where you live in McKinney, you can get the coverage you need with the Garret B Holubar. Give us a call at (214) 504-2675 today. Having the right amount of home insurance coverage can offer a great deal of peace of mind. At Garret B Holubar we are here to help you understand and choose policies that are just right for your property, structures, and possessions. The first step in being properly insured is to assess the details. Garret Bass Holubar or another of our experienced agents will discuss your McKinney home and valuables so that you get the coverage you need. We offer several specialized products to aid members with swimming pools, detached garages, additional buildings, and high-value items. Contact Garret Bass Holubar or another one of our qualified team members for more information about coverage for your specific situation. We can even help you choose a policy over the phone. Give us a call today at (214) 504-2675 for more information or to schedule an appointment. You can also stop by our office, located at 2411 Virginia Pkwy. Garret B Holubar and Garret Bass Holubar can help you find the right policy to protect your legacy and provide financial security for your loved ones when you are no longer living. Insurance is a smart investment. Getting the right policy is easier than you think. Call (214) 504-2675 for an appointment with an agent. Feel free to stop by 2411 Virginia Pkwy,McKinney,TX,75071 to discuss Nationwide coverage options in person. At Garret B Holubar, we've become experts in assessing the challenges and opportunities that come with managing a business in various industries, locations, and personnel throughout 75071. This expertise is part of the job we love doing so much - serving as knowledgeable risk management advisors to local McKinney companies. From commercial property and auto to general liability and more specialized products, let us review the various Nationwide coverage options with you. Often, a business owner's policy is the way to go for McKinney companies with different types of commercial risk, as this type of policy offers combined coverage and customized solutions. The experts at Garret B Holubar can help develop one of these policies for your company. We can also help you understand what's at stake, regardless of whether you're looking for a targeted risk management product or a policy with multiple layers of coverage. Garret B Holubar is ready to protect what you've worked so hard to build and better position your company for future growth. Moreover, we know that companies can't successfully pursue their long-term goals without taking care of their day-to-day operations. The flexible billing options available from Nationwide should help find the right fit with your budget schedule. Call us at (214) 504-2675 to set up your policy or to make an appointment to talk about your coverage in person. Our office is located at 2411 Virginia Pkwy. The Garret B Holubar also offers products in TX. Please call for information on products in those states. When you do business with our agency, you become a member of our agency family. Building a relationship with our clients is our top priority. We strive to be your trusted insurance advisor. The confidence you place in us will always be appreciated.